Former two-time title challenger Bernabe “The Real Deal” Concepcion is eager to show fight fans he still has championship potential when he returns to the ring after a fifteen month layoff to battle talented southpaw and former world rated Eden “Mr. Showboat” Sonsona in an exciting fight card at the Mandaluyong City Gym on July 26. The fight card is headlined by undefeated featherweight Dodie Boy “Dugong Kampeon” Penalosa, son of former two division world champion Dodie Boy Penalosa and nephew of the classy former two division world champion Gerry Penalosa and younger brother Dave “The Hunter” Penalosa,also a southpaw and a featherweight who takes on Danilo “Brutos” Gabisay. 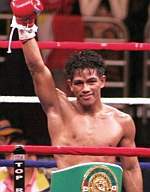 While the undefeated Penalosa brothers are regarded as promising prospects, Concepcion has been on the world championship stage and although he lost on both occasions was clearly robbed of a decision against then champion Steve Luevano in a WBO featherweight title fight in Las Vegas on August 15, 2009. Concepcion who was battering Luevano in round seven followed through with a punch in the heat of the action ending round seven and was disqualified by referee Jay Nady after Luevano acted as though it was a killer punch in the process drawing the ire of celebrated trainer Freddie Roach. In his second title shot Concepcion dropped champion Juan Manuel Lopez in the dying seconds of round one but got careless and was himself dropped in round two, losing by a knockout on July 10, 2010 in Puerto Rico. In his last fight Concepcion forced Thai slugger Boido Sumanjuntak to retire at the end of round 7 on April 21 last year after earlier scoring a 2nd round knockout of Richard Olisa on October 13, 2012. Penalosa who is promoting the Mandaluyong fight card with the fights to be telecast on Viva Sports top-rated weekly boxing show “The Main Event” on PBO over Sky Cable, said both Concepcion and Sonsona have been training hard and he expects a slugfest between two fighters who can punch. Concepcion has a record of 18 knockouts in 32 wins while the southpaw Sonsona has 10 knockouts in 32 wins, is also looking to recapture the form that earned him a smashing 2nd round TKO over Eilon Kadem on the undercard of a Manny Pacquiao title fight at the MGM Grand Garden Arena on November 14, 2009.